If you're looking for something small, compact & light in Portable Bag Closers, then this is your choice. A novel new design, this machine affords the user: comfort, ease of use & a feather-lightness on the hands. Just strap machine belt on the wrist & you're ready to go. Perfect for long hours of bagging & ever complaining labour.. ! 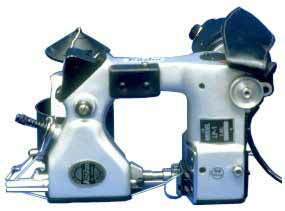 Small & compact machine body, weighing only 3.5 kgs with the thread roll. Comfortable fit on the wrist, with easy thumb-press micro switch operation. Belt-less motor drive no headaches of belt breakage / slippage. Belt-less drive results in faster motion of motor, thus faster stitching speed. Easy working design & very simple to clean & maintain.